"For years I have devoted my whole thought, strength, and energy to one thing -business, and have made myself master of that which I undertook to perform. I mean now to cultivate most assiduously the social ties which I have neglected so long fearing they may have become so weakened as to have no influence on my soul." William P. Letchworth was looking for the perfect site for a country retreat where he could entertain his family and friends. One morning in the spring of 1858 he stepped off a train as it slowly approached a bridge high above the Genesee River . Standing on the bridge, he was touched by the natural beauty of the powerful river rushing below. Gazing at the falls, he noticed that the sun shining on the spray below formed a perfect rainbow. While walking along the left bank of the river, Letchworth found a large two-story frame house located near the remains of the a burned-out lumber mill. Owned by Michael Smith, the house had been built by Alva Palmer in 1828. The view was spectacular, and as he gazed toward the South overlooking the falls, he knew he had found his country retreat. 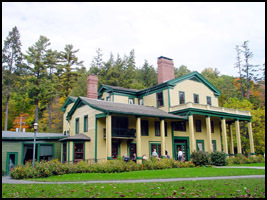 Letchworth acquired the house in February, 1859 and immediately began renovations. The local Indians had named the area "An-de-ka-ga-kwa", meaning "the place where the sun lingers", and it has been said through Indian lore that when the sun passes over the glen it pauses a moment longer there than at any other part of the valley. Inspired by this, Letchworth chose the word "Iris", a synonym for "rainbow", and named his estate the Glen Iris. As he studied the history of the Genesee Valley Letchworth became particularly interested in the life story of Mary Jemison, the captured child of a massacred white settlers raised by local Indians. 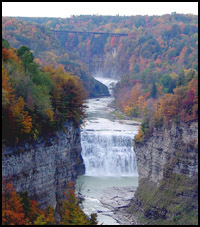 "The White Woman of the Genesee" had at one time lived several miles north of the Lower Falls, and in an effort to preserver her heritage, Letchworth had her remains interred on the Council House grounds, now part of his estate. William Pryor Letchworth was born in 1832 to a Quaker Family of high standing. As a humanitarian and historian, his desire was to have the Glen Iris, with its scenic grandeur, preserved in its natural state so future generations could enjoy the beauty so dear to his heart. Before his death on December 12, 1910, he made provisions for the Glen Iris and surrounding property to be a gift to the people of New York State to be used as a permanent park. In 1914 the American Society provided funds to enlarge the dining room at the Glen Iris and to add twelve new guests rooms and four bathrooms. It had been a tradition that Letchworth's guests at the Glen Iris plant a tree to commemorate their visit. Inspired by the tradition, the American Society named the new rooms after the trees that had been so lovingly planted by those long-ago visitors. The first innkeepers, Mr. and Mrs. Charles Baeder, began managing the Glen Iris in 1914. They were followed by Mr. and Mrs. Harry Beardsley, Mr. and Mrs. A. B. Davis, Ms. Eileen Curry, Mr. and Mrs. Peter Pizzutelli, and Mr. Michael Herzich. The staff of the Glen Iris wishes to welcome you to the Letchworth State Park and will endeavor to make your visit a memorable occasion.